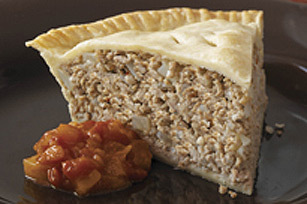 Tourtière is a French Canadian classic. Now you can make it at home with our Easy Tourtière recipe - just follow our three simple steps and you'll be enjoying this traditional meat pie in no time. Cook and stir onions in oil in large saucepan on medium-high heat 1 min. Stir in meat; simmer on low heat 10 min., stirring occasionally. Drain. Add potatoes and dressing; mix well. Simmer 10 min., stirring occasionally. Cool 10 min. Spoon into 1 pie shell. Remove remaining pie shell from foil pan; invert over meat mixture. Press edges of pie shells together to seal; crimp or flute edges. Cut several slits in top crust to allow steam to escape. Brush top with egg. Bake 20 min. or until golden brown. Serve warm topped with homemade apple ketchup, if desired.